One of the pins on a rom chip has broke off and I need to replace it. Can someone confirm that the chip in the manual is this one from Marco before I purchase it please? I think its the security chip, but Im not sure. Thanks! 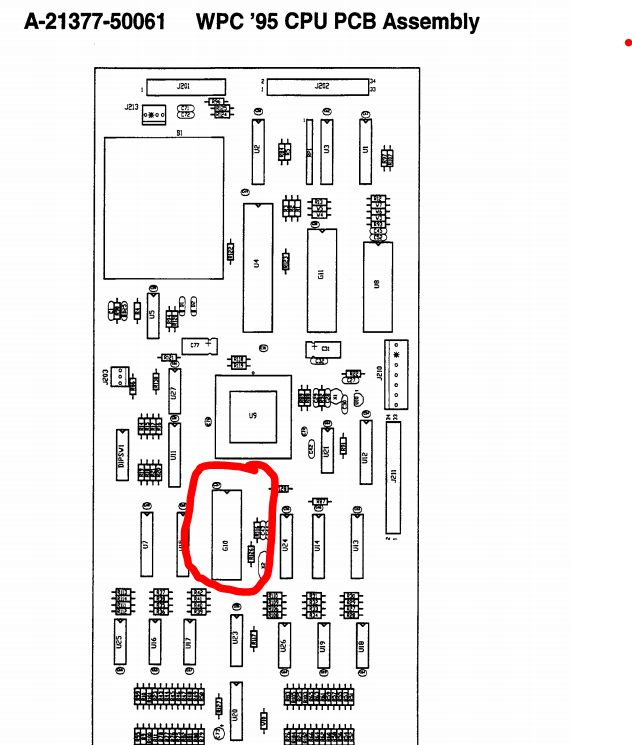 Here is the part from Marco: http://www.marcospecialties.com/pinball-parts/A-5400-50061-1 and the location on the board is circled. Yes, the component sell by Marco will fit perfect for your NGG. There is a little mistake on Marco Website, this part in labelled U22 instead of G10, but it's a minor error, the chip is really a G10 for WPC-95 pinballs. On both WPC-S and WPC-95 pinballs, Williams/Bally use a PIC µ-controler (that is a bit more complex than a simple EPROM). 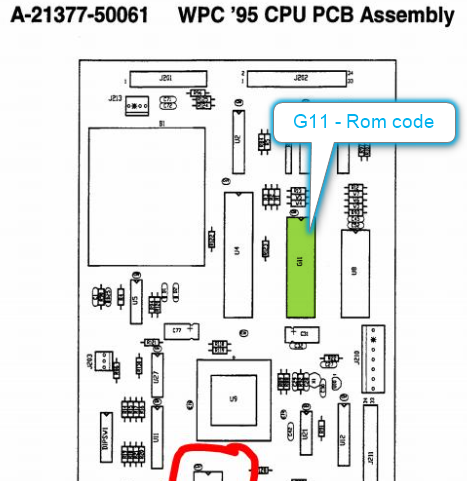 The name of the chip is U22 for WPC-S and G10 for WPC-95, but it's basically the same. The model of pinball is encrypted in this chip (561 for a NGG) and you should use the same number as the EPROM of the CPU board (ie, if you change the EPROM for Cirqus Voltaire - model 562, then you need to install the matching Security PIC with 562 ident). Only the model is checked, not the full serial number, nor the version of the EPROM. So this G10 for NGG will work with all versions. At startup, your pinball display the full serial number on dot matrix : something like 561 123456 12345 (where 123456 12345 is your serial number, printed on labels inside cabinet and on the G10 chip). When replacing the U22/G10 Security Pic, you loose your original serial number. All replacement chips are encoded with a generic number like 999999 99999 or something similar. If you don't care about your serial number, then the chip from Marco is perfect. But some pinball's collectors want to keep their serial number, so we (at Flipprojets) provide an on-demand service, and program chips with the serial you want. So there is a solution if you absolutly want to keep your original serial number. But if you don't care about it, then the Marco solution is fine for you. Also available at http://www.shiftedbits.com. $40, ship worldwide, in stock. I can make any serial number requested too, but have been selling security chips since 2001, and not a single person has ever asked for it. Right on, thanks for breaking it down for me! I have no sentimental attachment to the serial number, only to Buzz and Bud! Thanks again. You might want to consider the Universal Security Chip which can be used in any WPC-S and WPC95 machine. You should have a spare in any case, so that you can keep your pinball machine up and running until a new security chip arrives! One more question....I bought a new game code update Rom chip on ebay. Can someone please tell me which chip on the board I need to swap it out with? I cant find anything that looks right. Thanks in advance. Take care of the orientation of the chip when you insert it on the socket (watch carefully of the notch position). Strange question, because it's usually very easy to identify the chip location. On WP95 boards, the only chip having the size of 32 pins is G11 ! no other chip have the same size. The CPU has 40 pins, the G10/Security-chip has 28 pins and the RAM is not on a socket. Note that the Rom chip you get on eBay, may have a little different look than the original. But its size should be the same. Usually, the G11 Rom chip is an EPROM (UV EPROM), made in a ceramic package and having a window. Perhaps, the one you get, is an EEPROM, in a plastic package without window ? in this case, it don't care, an EEPROM can replace an EPROM. But only apparence change, not the package size (32 pins). May be, a picture of your board and another of the Rom you bought, will be useful to help you ? Yes, keep a spare in hand! Thats perfect thanks. Yep, the chip I bought doesn't have the window on it. I was looking for one that matched it, thats why nothing on the board looked right. Im about to give it a go. Thanks again for the help. You could also repair your security chip if there is enough leg stub to solder to. Scab a donor leg onto it.